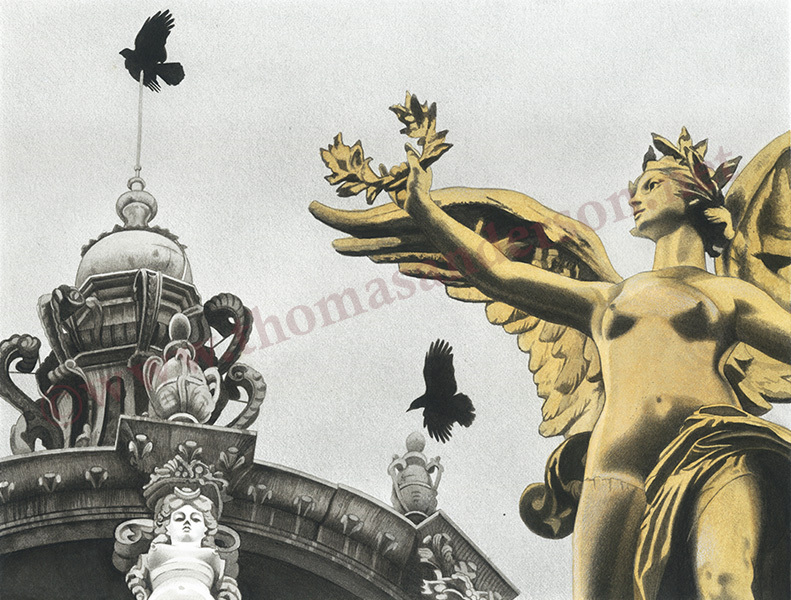 "Petit Palais avec des Corbeaux 11-12-15"
Ink, Graphite & Watercolor, 10" x 13"
I took a break from oils to create a series of small drawings that capture a few moments from our time in Paris. Drawing with mostly ink (and some some graphite and watercolor to get at different textures) is a fast and immediate but unforgiving way to work. Birds were, as they always are, everywhere in this beautiful, mesmerizing city, and I liked the interaction between the birds and the art and art history. This was the second piece in the series. Crows are ubiquitious in all ubran areas everywhere. While I have mixed feelings about why exactly that may be, crows are beautiful and undeniably among the most intelligent of birds. Paris is chock full of art, history and humanity in flux everywhere at all times. The Petit Palais, built for an early-twentieth century Exhibition, seems a perfect spot for these characters to be ingratiating themselves.